If you’re looking for etiquette books for situations that go beyond how to behave at a traditional dinner party or how to address your husband’s boss when he comes over for dinner, then How to Chat Someone Up at a Funeral: And Other Awkward Social Situations by Mark Leigh might not be the book for you. This book is a hilarious guide to etiquette when you are presented with awkward social situations. While the tips you learn in regular etiquette books about the regular and traditional *miigghhtt* help you in these awkward situations, please consider Leigh’s book the way to go when you find yourself in a situation that is far from normal. 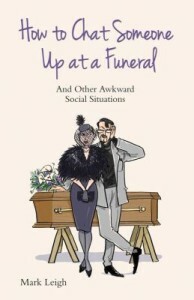 In How to Chat Someone Up at a Funeral, readers will find tips and tricks on how to deal with over 60 awkward social situations. The author doesn’t care how you ended up in any of these situations, just that you are well armed with advice to help you deal with what’s presented and that you leave with as much of your dignity and your life as intact as possible. The author includes such situations as how to break a curse, how to behave when invited to an exorcism, what to do when you suspect your girlfriend is a serial killer, what to do when challenging a co-worker to a duel, how to act when you inadvertently fart in the presence of the queen, and many, many more. I highly encourage you to pick up this book to learn more about what to do when you accidentally block a toilet at someone’s house, when you need to escape a mountain lion at a dinner party, and just like the title says, when you want to know how to chat someone up at a funeral. This hilarious book is full of steps and tricks to remember, as well as things you should avoid doing and sometimes even checklists to see if you’re really in that situation or are mistaken about what is happening around you. I really enjoyed the breakdown that the author, Mark Leigh, gives about each situation and the only caution that I would give to readers is that Leigh is from England, so some words he uses may initially be confusing, but I found the content he presented to far outweigh his word choice. So check out this book today and the next time you find yourself sharing a flat with a gorilla or having to bail out on a bad date with decency, know that the library has the perfect resource to help you out! 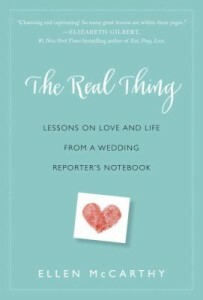 Ellen McCarthy has written a charming set of lessons about living and enjoying love in her book, The Real Thing: Lessons on Love and Life From a Wedding Reporter’s Notebook. What intrigued me the most about this book was that McCarthy was a skeptic about the whole wedding business and love when she first began reporting about weddings and even after she married. She sometimes is still skeptical, but feels that working as a wedding reporter has allowed her to find a set of resources, whether those resources are married couples, the notes she’s scribbled down, or the books she has read, that she can utilize to keep her marriage strong and alive. This book serves as a collection of the lessons she believes everyone should be aware of regarding love and life. McCarthy writes throughout this book that she took her job as a wedding reporter because she wanted to write about people. Sure, she would love to have a Saturday night off to go and hangout with her friends, but once she is sitting and waiting for the ceremony begin, she is immediately thrown into a new beautiful love story and the beginning of a new life together. 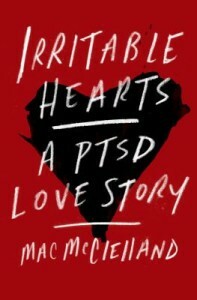 McCarthy tackles the questions of “How do you know this person is the one?”, “Should we live together before marriage?”, and even “Should I call the wedding off?” McCarthy admits to being far from a marriage and love expert and that is why she augments her written beliefs within this book with multiple interviews from experts, as well as interviews and snapshots into the weddings and lives of the people she has interviewed for her job. McCarthy has gathered together a multitude of information about how people go about finding love and the life they want. This book is eye-opening for people in all stages of relationships, from single to happily married for years to divorced, and provides help for those who may need a little push to understand the life they are living now. 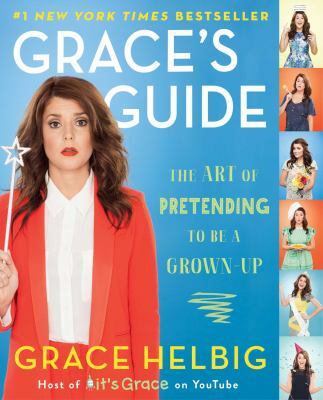 Grace’s Guide: The Art of Pretending to be a Grown-Up is a guide for anyone and everyone who needs help in any situation (broad description, but hang on, I promise it will make sense). The author of this book is Grace Helbig, the host of it’sGrace, a YouTube vlog(video+blog) where Grace enthralls viewers with everything from quirky food recipes, teaching people how to fall down in public, to even taking a good hard look at how the President chooses to dress himself. She might also be familiar to you as a guest star on Hannah Hart’s vlog, My Drunk Kitchen (check out Hannah’s book, My Drunk Kitchen). In Grace’s Guide: The Art of Pretending to be a Grown-Up, Grace talks her readers through the little tips that she wished someone would have told her when she was in college, dealing with anxiety, trying to be a good party guest, making adult friends, and dealing with all the aspects of friend and significant-other relationships. Some of her advice ranges from the quirky (don’t get stuck with the pet at the party), the painful (make peace with the idea of failing when asking someone out – realize it might happen, then get over it! ), and the helpful (get out of the house and be around other humans after a break-up). This book is broken up into multiple sections about a variety of different scenarios that people who are trying to be grown-ups will face on a daily basis. In addition to her advice, Grace imparts “Mom’s Words of Wisdom,” handy acronyms for you to remember the advice she just gave you, and even little worksheets for you to fill out. Grace tackles difficult topics that need to be talked about in such a fun and entertaining manner that readers don’t even realize that she’s actually helping.